Summary: This article documents a longitudinal research study conducted by members of the UC Irvine Writing Project in partnership with a large, urban school district in which 93 percent of the students are English language learners. Over an eight-year period, 55 secondary teachers implemented a cognitive strategies approach to reading and writing instruction designed to make visible the thinking strategies that experienced readers and writers access in the process of constructing meaning. An important resource, this would be useful as a text for study in a professional development program or for individual teacher research. The project “was not just an abstract research study; it was a concrete attempt to level the playing field for specific EL students in a large urban school district through sustained, ongoing collaboration with a dedicated and committed group of teachers…” The consistency of positive outcomes on multiple measures strongly points to the efficacy of using this approach with EL students. 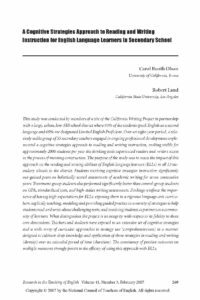 This article by Carol Booth Olson and Robert Land appeared in NCTE’s journal Research in the Teaching of English. It describes a study conducted by members of the UC Irvine Writing Project in partnership with a large, urban, school district, primarily serving families of low socioeconomic status, where 93 percent of the students speak English as a second language and 69 percent are designated Limited English Proficient. Over an eight-year period, a relatively stable group of 55 secondary teachers implemented a cognitive strategies approach to reading and writing instruction. Teachers and students were exposed to an extensive set of cognitive strategies and a wide array of curricular approaches to using them, in a manner designed to cultivate deep knowledge and regular application of these strategies in reading and writing. The consistency of positive outcomes on multiple measures strongly points to the efficacy of using this approach with ELL students.